Santorini holidays take you to a lovely Greek Island lying in the Aegean Sea. Although volcanic in origin with little natural vegetation, the houses with their blue doors and shutters and the churches with their blue domes, have a very attractive effect. Add to this the trailing blossom around doorways and hanging from window boxes and pot plants, and the absence of natural flora becomes insignificant. If you are looking for a guarantee of hot sunshine in pleasant surroundings, a cheap Santorini holiday should fit the bill. Families with young children should note that the beaches are volcanic and apart from the odd one, such as Perissa, are not bucket-and-spade-friendly. A range of water sports are offered. Santorini, because of its romantic image, is popular both for honeymooners and for wedding parties. 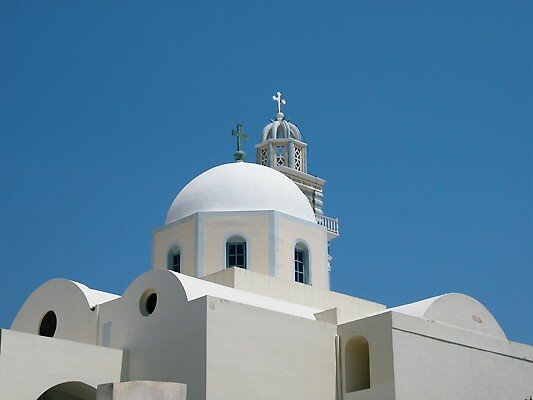 Santorini is a relaxed, friendly place which offers good accommodation and service. If you enjoy shopping, a bus trip to Fira with its hundreds of small shops, is essential. The plethora of restaurants cater for all tastes. Although many serve British food, do try local fare which is both delicious and inexpensive. Most visits to Santorini take a trip to Oia to see the vivid sunset. Many local airports have direct flights to Santorini so you benefit from shorter journey times and cheaper costs. Santorini enjoys a long season that extends from March until the end of October with the mercury rising into the thirties during the summer months. It seems that everyone these days is trying to reduce expenditure whether they are food and clothes shopping or when making larger purchases such as cars and holidays. Searching through page after page on the internet looking for the best deal is very time consuming. We can help you find the cheapest Santorini holiday very quickly. Sandy Dunes Holidays is a price comparison site and our search engine is simple to use and will, within a few seconds, find you the cheapest holiday to your chosen destination. With access to Santorini holiday discounts from over three dozen holiday companies, including some market leaders, you'll be delighted by the competitive prices. Since Santorini holiday offers change daily, do your search, ring the number and book today.